Contemporary icon painters of the northeast U.S. are keeping traditions alive that stretch back to the 1st century yet carry on a mysterious and luminous art form that is vibrant and in constant demand even today. Four iconographers -- Jody Cole, David Palmer, Peter Pearson, and George Philipos -- present icons in the Russian and Coptic styles at the C.X. Silver Gallery in West Brattleboro from December 5, 2008 through January 4, 2009. The icon is intended to be a medium of communication, a way to express beliefs and values. In fulfillment of this purpose, the symbolism in Orthodox iconography is complex and pervasive. This symbolism is expressed in combinations of specific colors, graceful lines, and surrealistic forms, and even apparent distortions in perspective and proportions. The depiction of the physical features of holy personages is not intended to be a naturalistic portrait. The icon is viewed as a "window to the Divine," serving as a family portrait that makes present the material memory of the sacred person represented. 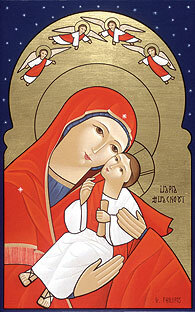 An icon is a stylized sacramental sign to an Orthodox Christian, an integral aspect of their spiritual path. Today there is a renewed interest by Protestants and Catholics in the importance of holy icons in their own spiritual practices. Even though the iconographic tradition allows individual styles and talents to emerge, the iconographer does not prize "creativity" in its own right. Most often she or he seeks first and foremost to remain faithful to the liturgical-sacramental purpose of Orthodox iconography. And in spite of this, creativity pervades these images. The Coptic images are distinguished by two important characteristics: the first is putting emphasis on the head (representing the intellect), at the expense of the body, and the second is putting emphasis on the eyes (representing eternity), at the expense of the head. One of the images, bearing the title "The Christ of Silence," is rarely done, having first appeared in Russia in the 16th century. This title and the depiction refer to a pre-incarnation Christ figure who shows a profound willingness to submit to the Passion in silence. The crossed hands express a meditative and humble attitude. The 8-pointed star in the crown denotes divinity. The figure appears with wings like an angelic being. This exhibition has been organized by David Palmer, iconographer and retired Director of Exhibitions of The Newark Museum, Newark, New Jersey. Mr. Palmer is a graduate of the Art Department at Wilkes University, Wilkes-Barre, Pennsylvania, and completed a Master of Theological Studies degree at Drew University, Madison, New Jersey. His studio is at Totts Gap Arts Institute, Bangor, Pennsylvania. Jody Cole has been painting since 1980 and is a graduate of King's College, Wilkes-Barre, Pennsylvania, with a BA in Theater and Art. She studied with iconographers Vladislov Andreyev, Alexander Rosenkreuz, Peter Pearson, and Valentin Streltsov. In recent years she has conducted iconography writing workshops, written commissioned icons for churches and individuals as far away as Italy, and lectured on the history, symbolism, and technique of icon writing. Her website is at jcoleicons.com/Site/Home.html. Peter Pearson is a leading American iconographer. He has created hundreds of icons for private collectors, churches, and other institutions throughout the world. Mr. Pearson also studied architectural drafting and color at the International Institute of Design in Washington, D.C., and theology, with a specialization in liturgical studies, at Saint John of Damascus Seminary in Boston, Georgetown University, and at Saint Vincent Seminary in Latrobe, Pennsylvania, where he completed a Master of Divinity degree. A former Benedictine monk, he now serves as a priest at St. Philip's Church of New Hope, Pennsylvania. His website is at www.nb.net/~pearson. George Philipos was born in Egypt. He attended the Faculty of Fine Arts at the University of Alexandria, where he obtained a Bachelor of Fine Arts Degree. At present, his passion in Coptic Art is manifested in his paintings with religious themes. Mr. Philipos has been commissioned to paint Coptic icons for various churches in Egypt and the United States. More information on his work is at: www.geocities.com/gsph2002. Besides its association with styles of icon painting, Coptic is the ancient language of Egypt, the spoken form of the hieroglyphs. It was the general spoken language of Egypt until the 10th century and finally gave way to Egyptian Arabic in the 17th Century. A small number of people around the world continue to speak Coptic today, and it remains a liturgical language of the Egyptian orthodox Christian community. It is taught at the university level for students of Egyptology. More images and information on the exhibition is found on the artists page at www.cxsilvergallery.com. EDITOR'S NOTE: The C.X. Silver Gallery is open from 4:00 to 7:00 on Gallery Walk evening for visitors. An artists' reception with Palmer and Philipos is scheduled for Saturday, December 6, from 2:00 to 5:00 pm. Tom Baehr will play the dulcimer for the enjoyment of attendees. C.X. Silver Gallery is located at 814 Western Ave. (Route 9), in West Brattleboro, one mile west of I-91 Exit 2, on the left.